If at any point we thought the rain we’d run into on the Sonora Pass was going to be the toughest part of our day, we had another thing coming. We watched the lightning striking and listened to the rumble of thunder echo between the peaks of the hills towards Monitor Pass. Was this payback for us skirting around the rain a few days prior? Was it finally time to cash in our rain chips? The higher we climbed the more threatening the clouds became. We stopped at a pullout on CA 89 weighing our options. I asked two guys who had come down the pass what the conditions were like further up the road. One of the guys said the road was covered in hail but if we stuck to the tire tracks that were already on the road, we should be fine. He sounded pretty easy going about the whole thing so we opted to continue up. 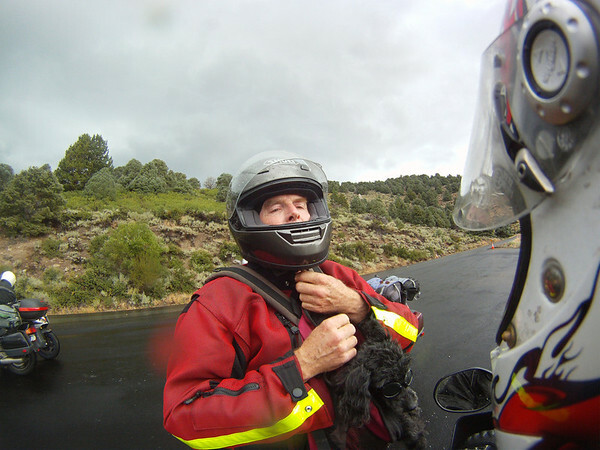 How can you not trust a guy who rides attached to a poodle? As we were about to pull away, a pickup truck stopped to tell us the road was covered in ice. ::sigh:: Maybe we’re just a bunch of idiots, but we kept moving forward. I proceeded cautiously. Again it was difficult to tell if the fresh shiny black pavement was just wet or if it was icy. That is until the potential hazards became obvious. 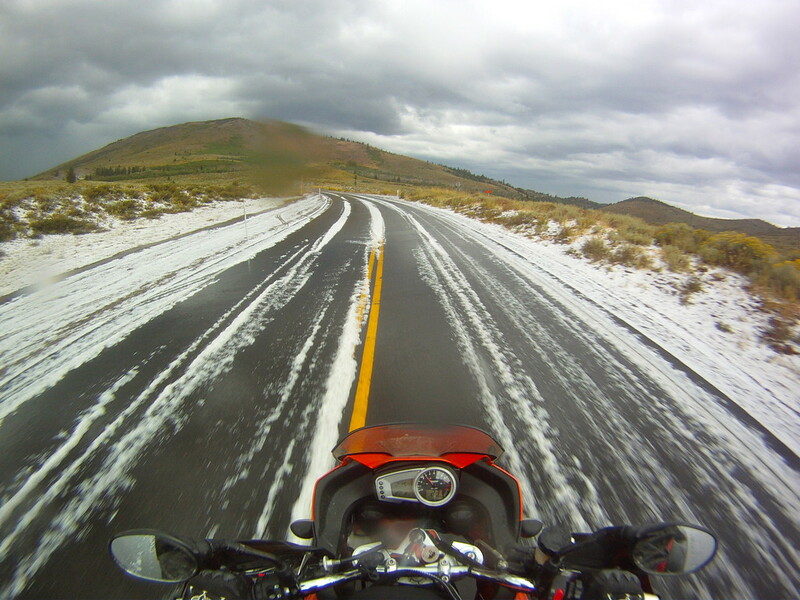 Riding through the hail was just as poodleman had suggested. We stuck to the open tracks and were just fine. 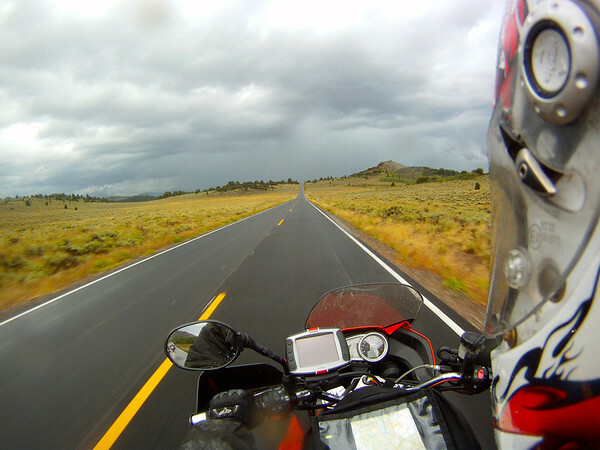 There was no sensation of the road being anything other than wet. Apparently one of these guys didn’t do as well though. He came through before there were any tracks to ride in and wiped out. 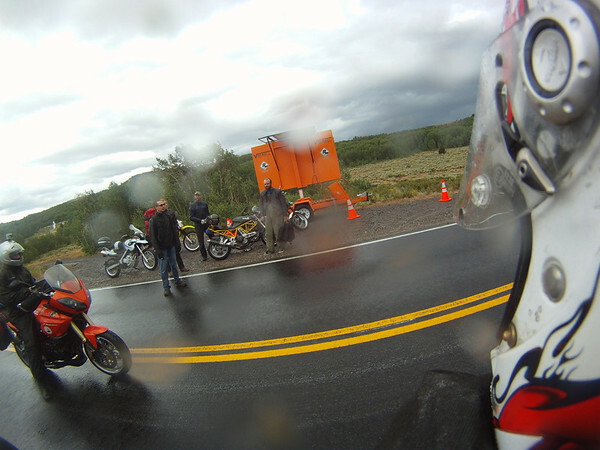 Some other riders were helping him get his bike back together to head down towards 395. The rain and lightning seemed to hang stalled over CA 4. Sadly this was one of the routes I really wanted to ride. Taking stock of the situation, we’d been served several warnings that maybe we would be pushing our luck by heading into the brunt of this storm. With one more aggressive crack of thunder and a few bolts of lightning it became clear that was time to err on the side of caution. With the afternoon light burning and a storm that we couldn’t shake we decided to make tracks for Lake Tahoe to get a room for the night. It was the smart thing to do. CA 4 would have to wait. OMG - I Saw Bigfoot in California! Hail on the road and on rental bikes, too? Ballsy! Sometimes I think I can be optimistic to a fault. I kind of figured after talking to that dude, if it looked bad ahead, we could always turn around. ROAD TRIP – in spite of the crappy road conditions it still looks like a lot of fun and that you are meeting some great people, the perfect road trip! 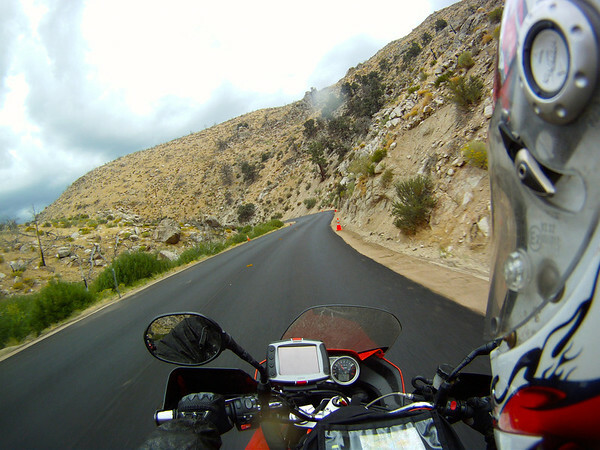 I did this road in 2010, rode from Lake Tahoe following State route 89 all the way to U.S. Route 395, then followed it to Lake Mono and eventually Yosemite, amazing roads, the southern part of 89 was simply amazing. It’s Not You, It’s Me. Seriously.